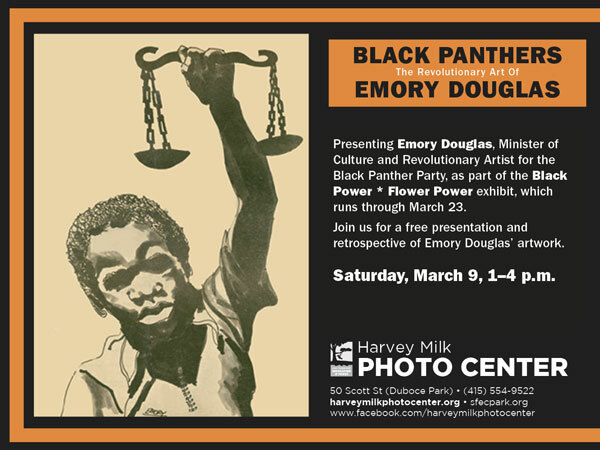 Free Artist’s Talk: Black Panther Artist, Emory Douglas, March 9, 1–4 p.m. Presentation: Emory Douglas, Saturday March 9, 2013 from 1–4 p.m.
Harvey Milk Photo Center is pleased to present Emory Douglas, Minister of Culture and Revolutionary Artist for the Black Panther Party, as part of the Black Power * Flower Power exhibit, which runs through March 23. Join us for a free presentation and retrospective of his artwork. Offering a retrospective look at artwork created in the Black Panther Party, Douglas’s work has been displayed at the 2008 Biennale of Sydney, in Sydney Australia, the Museum of Contemporary Art in Los Angeles California, Yerba Buena Center for the Arts, and the African American Art & Cultural Complex, both in San Francisco, California, Richmond Art Center, Richmond California, Station Museum of Contemporary Art, Houston Texas. Emory has appeared in the 2008 June/July volume of Art in America, PRINT Magazine, American Legacy Magazine and the American Institute of Public Arts. Published In 2007, Black Panther: The Revolutionary Art of Emory Douglas provides a comprehensive collection of Douglas’s work. Douglas’s exhibits include the Arts & Culture Conference of the Black Panther Party October 17–18, 2008 in Atlanta, GA and a major retrospective exhibit of past and present work at Urbis in Manchester, England, which ran from October 30, 2008–April 19, 2009. Douglas had another major retrospective exhibit in New York, July 21, 2009, at the New Museum of Contemporary Art. Thereafter Douglas did a forty day art in residence at the Elam International School of fine Arts, in Auckland New Zealand (Aotearoa),with a retrospective exhibitions of his artwork at the Gus Fisher Gallery and onto Brisbane Australia for eight days for an art lecture and exhibit at Milani Art Gallery. Emory Douglas was born May 24th, 1943 in Grand Rapids, Michigan. He has been a resident of the San Francisco California Bay Area since 1951. Douglas attended City College of San Francisco where he majored in commercial art. He was politically involved as Revolutionary Artist and then Minister of Culture for the Black Panther party, from February, 1967, until the Early 1980’s.